I am a little late to the show this year but on December 21st the infamously fiery Gävlebocken (Gävle Goat) was once again burnt to smithereens. As per tradition I scraped a live webcam of the blaze and set it to some holiday music for your viewing enjoyment/horror. The 2012 Gävle Goat was almost knocked down before it even got up. According to Swedish newspaper The Local, private security guards are keeping an eye on this years Gävle Goat after arsonists nearly burnt it down on Saturday, before it was even inaugurated. The goat’s leg was ignited briefly before being extinguished by a heroic passer-by. “The front hoof smells of petrol,” event organiser Eje Berglund told the crowd that assembled on Sunday for the official inauguration. Last years blaze was a sight to behold. Four University students have taken it upon themselves to try to stem the tide of arson by creating an “I Love the Goat” campaign. 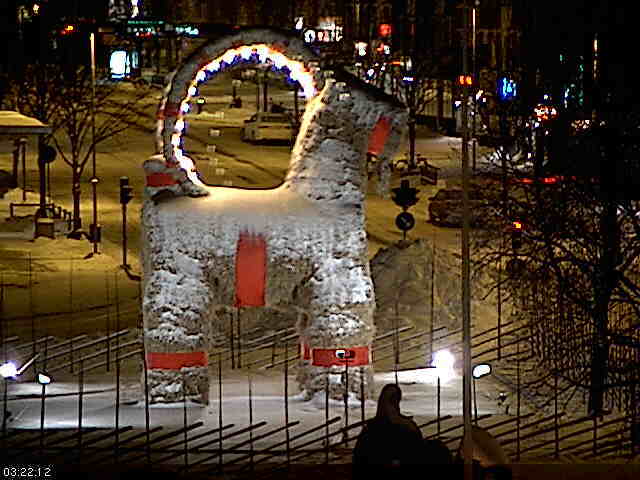 There is a live webcam of the Gävle Goat if you’d like to keep tabs on whether it will continue with its fiery history. If you’re looking for the 2012 video of the burning Gävlebocken (Gävle Goat) go here. This season’s Gävlebocken or Gävle Goat has already burnt to the ground. The Gävle Goat is a giant version of a traditional Swedish Yule Goat figure made of straw. It is erected each year over a period of two days by a local association called the Southern Merchants in time for the start of advent. The goats have become the subject of a ‘tradition’ of regularly being torched by vandals. The 13-meter (42+ feet) tall, straw, Christmas goat was set ablaze by arsonists at 2:54 a.m. this morning in Gävle, Sweden. Despite emergency services arriving on the scene within a few minutes nothing remains of the goat but its scorched frame. Currently the Gävlebocken only has a 39% survival rate. Below is time-lapse video taken from a webcam of this years goat. The webcam is still live if you are interested in having a look at it’s charred remains.